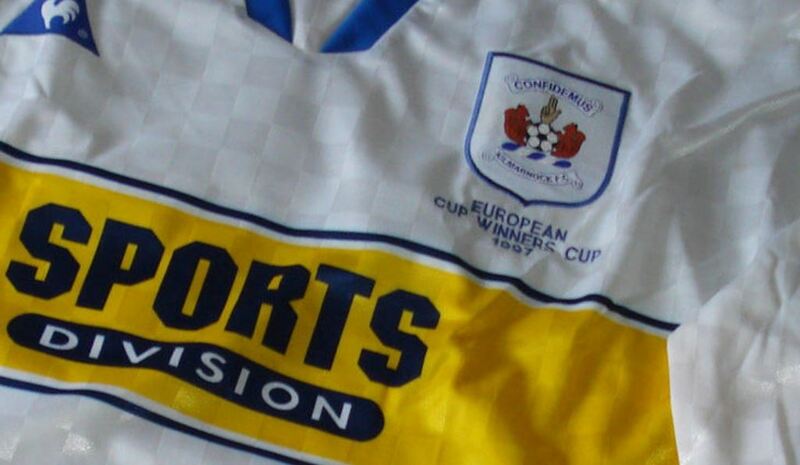 Kilmarnock qualified for the first round of the European Cup Winners' Cup, but not before being given the fright of their lives by Irish part-timers Shelbourne at Dublin's Tolka Park. Leading 2-1 from the first leg a fortnight ago, the Scottish Cup holders could not have wished for better start when Jim McIntyre blasted home from 25 yards in the 21st minute. But Dessie Baker, the former Manchester United starlet, deservedly equalised six minutes before the interval and Shelbourne came desperately close to taking the tie to extra-time after the break. The Shelbourne defence was sliced open by Billy Findlay for McIntyre's goal, which was helped into the net by the gale-force wind. And McIntyre, in for the injured Paul Wright, almost grabbed a second 10 minutes later, but this time his close-range header was narrowly off target after David Bagen had created the opening. Shelbourne would not lie down, though, and Mark Rutherford went desperately close to equalising in the 33rd minute, when his header from six yards was inches wide after a neat interchange between Baker and Pascal Vaudequin. However, Baker made no mistake six minutes later following a dreadful error by Yugoslav keeper Drago Lekovic. His attempted clearance never reached Ray Montgomerie and Baker nipped in to shoot home from 20 yards. With the driving rain and strong wind in their favour in the second period, Shelbourne went desperately close to levelling the tie on aggregate. They were guilty of missing two chances - first when Dave Campbell shot wide with the goal at his mercy and then when Pat Fenlon had a snap-shot pushed round the post by Lekovic. It was real backs-to-the-wall stuff for the Scottish Cup holders and Campbell had a header cleared off the line by Bagen with his keeper beaten. In a rare breakaway McIntyre might have stretched Kilmarnock's overall lead after a flick by Mick Neville, but Alan Gough denied the striker. 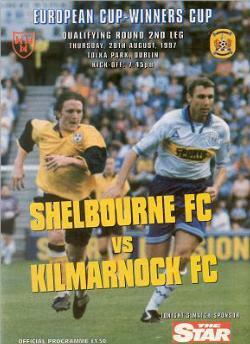 Shelbourne poured forward in the final minutes, but could find no way past a resolute Killie defence in which Montgomerie and Kevin McGowne were outstanding, while Lekovic made up for his early blunder to deny Baker and Pat Scully in quick succession. No wonder the 1,500 Kilmarnock supporters were whistling long before the end as the Scots held out to book their place in tomorrow's draw. Kilmarnock: Lekovic, McPherson, Montgomerie, McGowne, Baker, Mitchell, Findlay, Reilly, McIntyre, Nevin, Bagan. Subs: Burke, Wright, Roberts, Hamilton, Varille, Anderson, Meldrum. Kilmarnock boss Bobby Williamson was a relieved man as he flew back to Scotland from Dublin ...."I don't really care who we meet in the next round. I'm just glad to have left Dublin and realise that we are still in the competition when the draw is made in Switzerland today, We started well and got the goal we needed. I thought it was a great strike by McIntyre, But then we gave away a terrible goal before the interval which was just not acceptable at this level, We were never able to relax during the whole match and we let Shelbourne back into the game, and to their credit they fought all the way to the end,"
Shelbourne manager Damien Richardson's comments..."Kilmarnock were on their knees in those last 10 minutes after we had dominated the second half, Perhaps we tried to play too much football in the latter stages instead of pumping the ball into the box.If I was Bobby Williamson, I would suggest to his players that they don't keep enough possession once they are outside their area. You cannot play European football by defending in your own half. However, good luck to Kilmarnock. We knew it would never be easy for them, and I really do hope that they have a good run in the competition,"
Killie goalscorer Jim McIntyre ..."That's one of the most important goals I have ever scored. I thought we would get the chance but it was a question of whether we would take it. I don't know how long I will be out (he had a knee operation after the match) but I'm delighted I played my part in getting the club through. Whether I'm there or not in the next round doesn't really matter. The important thing is that Kilmarnock are there and I would love to make at least the second leg."